Are you afraid of the dark? Me either, but darkness brings about a whole new set of challenges you don’t need. When the power goes out and it happens at night-time, I can still get around my house just like most of you could as well, but not as quickly as I do with light. I can still make it out of my bedroom and down the hall to the kitchen, but navigating familiar paths isn’t really crucial. Light is needed for a lot of things more important than walking down the hall and having a plan for light if you lose power is another important step in becoming prepared for any emergency. Since the dawn of time, man has been looking for new ways to shed light into the darkness. Light dispels our fears, helps us search for things and gives us better visibility for certain tasks. If you don’t already, you need to have back-up lighting for your home, bug out vehicle and person so that you won’t be hampered in a low or no light situation. There are several low-cost options that we will be discussing that can allow you to see through the darkness when you need it most. Candles are probably one of the oldest forms of light. They are simple to use, require no electricity, and I know there is something special about eating by candlelight, but they do have drawbacks as well. Candles do not put off much light, so you will normally need more candles in a room to have any decent light output. A single candle can light things up enough for walking around and simple tasks, but even reading a book with a single candle could strain most people’s eyes. You can also cook or warm up food with candles and they do put off a good bit of heat so in a colder situation this can have a double benefit. Candles can also be made from beeswax so if you keep bees you can be set for life in your own candle making materials. I wouldn’t plan on this unless you are already making candles, so have a supply of your own before you need them, unless you are planning on taking up beekeeping soon. In our house we have a few different options for candles. When I started prepping, I was out at the grocery store and saw the big candles with the saints printed on the outside of glass containers. I am sure someone will illuminate me as to what these are for; I think it is a Catholic religion practice, but to me, these were survival candles! I quickly bought a few of these for back-up light. Then I went to Wal-Mart and bought about a half-dozen decorative candles about the size of a coke can. Lastly, I found a site online that sells candles in bulk. I believe it may have been Candles 4 less and I got a whole box of 15 hour candles. These fit nicely in a box along with the rest of my supplies. For me lanterns make the most sense for a heavy-duty light, but they are not without issues either. 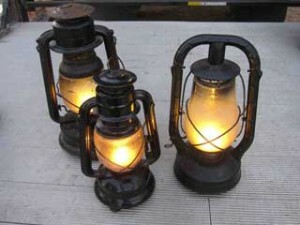 There are a few different types of lanterns that I have or have considered for light if the power goes out. The first type is the old style oil lamps and you can get these from a lot of places like Lehmans. Actually, now that I look at the prices again, they have come down and there are a lot of good options for oil lamps on this site. Oil lamps can put off much more light than a candle and have a sturdier base. If you have a reflector, the light is magnified slightly and makes a better choice for a whole room light. Also, with oil lamps, you can walk around a little easier with them since most have a guard over the flame to prevent wind from blowing directly on the light. Oil lamps too are dangerous potentially if they are dropped or the flame touches something else. I would recommend these maybe in situations where children aren’t involved or ensure great care is taken using them. I know they have been used for years, but they have also started fires for years, so just a simple word of caution. Kerosene lanterns are another good option, but they like propane need to be vented. One good thing about propane is that you can use the same fuel you have stored already for your Kerosene heater. Propane lanterns are incredible and I have one that I use for camping and as a backup for power outages. The light these things put out is incredible and you can even cook on them they get so hot. Propane needs to be vented though so you don’t want to use one of these in your house without proper ventilation. I have purchased a good amount of additional propane cylinders and mantle wicks so that I can use these for a good long time if needed. This lamp is my ideal dual-purpose light that is safe enough (with those exceptions I mentioned) if your power goes out or if you are out in the woods. With any time of flame based lighting it is important to have proper fire extinguishing equipment close by in case of any accidents and I would never recommend leaving these lit when you are sleeping. If you haven’t yet read our post on tactical flashlights, we cover a lot of ground in there, but the safest light you can have is a good old trusty flashlight. Flashlights come in all flavors and sizes and we have a couple of different options for the different uses each one needs to fill. For hands free operation, if you are going to be moving around I have to recommend a headlight. Headlights have been around for years in various configurations. You might have the image of a coal-coated miner walking around with the big light strapped to his head with the big square battery strapped to a black hard hat. They have come a very long way. Headlights now are extremely light and much more powerful thanks to LED light bulbs. I have Petzyl headlamps for everyone in my family and they were perfect for camping or hunting. Most use 3 triple AAA batteries so you aren’t stuck with hard to find battery needs. The ones I have adjust the tilt so you can easily shine the light on your lap if you want to see what you are eating or out ahead to light up the trail as you walk. They also have three modes (low, high and strobe) for different lighting situations. They are held on your head by a comfortable elastic type of band that isn’t too tight and is easily adjustable. I take mine with me whenever I am camping like I said and also on long car trips, because if I have to change a tire in the middle of the night, I need both hands free. You can wear these around the house to do anything and when you aren’t using them, just pull them down around your neck. You can also take them off and shine them at the ceiling if needed for a really nice ambient light. Regular hand-held flashlights certainly have their place as well and we have several different types and styles of these. I recently ordered some incredibly cheap led lights from FordEx Group that are less than $4 and have an output of 300 lumens! I am testing them now and will write-up my review after I put them through some more paces, but you can’t beat a light like this at that price. Is it waterproof and shock-proof and able to be driven over by a truck? I don’t know but at $4 I can buy a whole bunch of these lights and still have money left over for a box of MRE’s. Batteries are an important consideration I’ll admit with flashlights, but you can purchase rechargeable batteries and a handy solar recharger to keep you supplied with plenty of light for a long time. Solar powered lights are great alternatives, but you need the sun obviously. These lights are going to need charging and put out much less light than you would expect. I have heard of people who plan on using their sidewalk lights if needed and I think that is a creative use, but I wouldn’t count on that for the best alternative lighting you can have for your family. Great in a pinch, but not the best option in my opinion. I am sure most of you have seen the hand cranked flashlights for sale. These have a small motor that is activated when you either crank a handle like a fishing rod or squeeze a lever like a stress ball for a long time. This sounded great to me when I first heard about it, but after trying to use these a couple of times, I decided that they aren’t going to work for me. I am all for exercise, but not when I need light. When it counts, I want bright light that can help me see what I am looking for, or illuminate what I am trying to do. The hand-crank lights are novelties for me that just aren’t the best solution. Hopefully, this gives you some ideas on lighting options for emergency situations and how you can be prepared to keep the lights on even when the power is out.